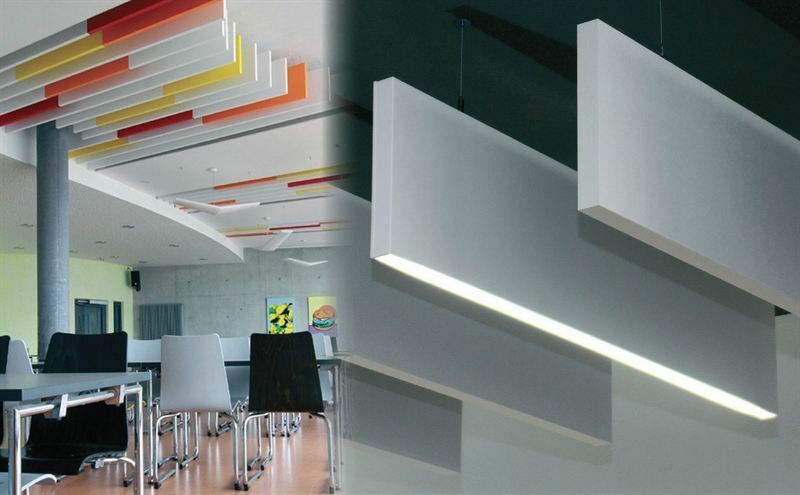 The new acoustic BLADE range from Spectral is a combined luminaire and acoustic panel for the modern office or educational buildings with concrete interiors. The suspended fittings provides effective acoustic management of generated sound while also making a significant contribution to ambient thermal management where it can achieve a cooling capacity reduction of approximately 3%. The high performance panels from Spectral also offer a striking visual alternative to traditional horizontal acoustic boards. The recent architectural trend for using bare concrete interiors has created a need for effective acoustic treatments to deal with the increased noise levels generated. Blade is manufactured in conjunction with GfAG in Germany and combines a high performance acoustic panel and luminaire in a range of output choices for T5 lamps with new LED options currently in development. Available in a range of RAL colours and finishes, BLADE is manufactured from a sound reflective material that will complement all types of interior design. The fitting is easily installed and comes with a suspension kit to allow custom configuration to suit each building and lighting scheme. The luminaire version blends in seamlessly with the matching acoustic panels and removes any concerns of shadowing in the lighting design. A typical arrangement of Spectral blades will include one luminarie version in every four runs. This arrangement will achieve both the thermal management and acoustic properties of the design, as well as providing ample light to the desired area.